The Upper Elementary section is an essential stage in the student’s education since it is the base of the student’s development and his/her acquisition of a wide range of learning skills and concepts. It provides the proper basic knowledge of all subjects which enables students to move on easily with their education. In the Upper Elementary section, students learn through using hands on activates, critical thinking and experimental discovery while working as individuals, in pairs or groups. Our goal as educators in the Upper Elementary section is to accept students as they are and help them believe in their capabilities and talents and improve as a long life learners. We also encourage students to accept others and respect their identities and differences. We also identify students who have learning difficulties and weaknesses early in the scholastic year and give them special attention and help. The Upper Elementary section covers classes four through six (ages nine to eleven). English and Arabic are the main languages of instruction. French is given as a second language. Basic principles and concepts of Math, Science and Social Studies are included in the curriculum. Other important components of the curriculum are Music, Art, Physical Education, Drama, Computer, and Christian Education and many other soft skills programs like ProtectEd, Leader in Me, Etiquette and Civility. These subjects are taught by certified and well trained teachers. Raising our learners while using holistic life approach is one of our main targets. 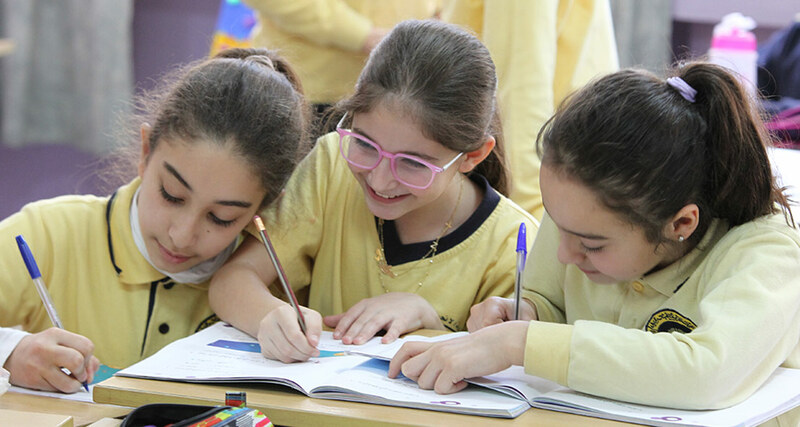 The Upper Elementary section offers two programs; the Lebanese and the American one. A special Arabic program is offered as well for students who were living abroad and have a second nationality or their Arabic level is not up to the standard one. These students take a special Arabic course during Arabic hours with the help of a specialized teacher. Students who enroll in the Upper Elementary section with no or minimal knowledge of French are given a special French course too. Upper Elementary students are involved in many projects and activities such as art handwork, musical programs, computer projects, athletic activities, music shows, community outreach programs, fundraising events, awareness campaigns for so many vital causes, and many cross curricula projects. They also have many educational and recreational outings and fieldtrips. Besides, my team and I will try our best to help you in every way possible. I am looking forward to working together with you so we can all cater to our students’ needs the best way possible.